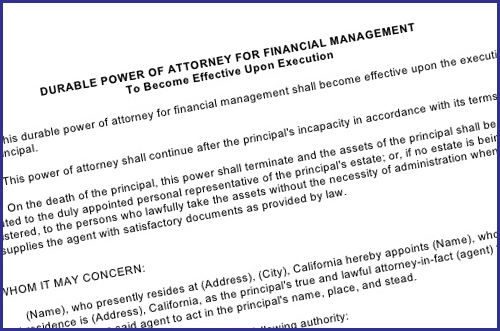 A Durable Power of Attorney for Financial Affairs (DPOA) appoints someone you trust to handle financial and legal transactions on your behalf during your lifetime. You can choose to have it take effect immediately or only go into effect upon incapacitation. When used properly, the DPOA can avoid the need to establish a Conservatorship. It is a very important document to have.